Zira is a lioness who was the leader of the Outsiders, and the mother of Nuka, Vitani, and Kovu. She was the main antagonist in The Lion King II: Simba's Pride. She's extremely loyal to Scar throughout the movie. It is unknown whether any of these cubs are actually Zira's as it's hinted that Kovu was "handpicked by Scar" in the film, and none of the others origins are known. All three cubs have an unknown father, though it is speculated that Scar may be the father of Nuka and/or Vitani. 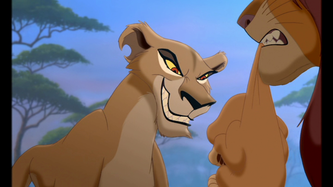 Zira is very impulsive, ruthless, and opportunistic, as shown when she prepares to attack Simba in broad daylight while he is alone until his pride shows up. 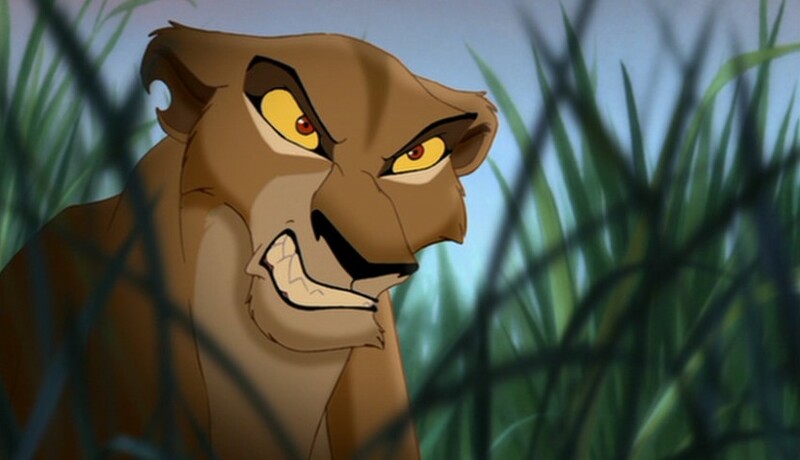 She is manipulative, as she warps Kovu's mind into killing Simba and, like Scar, seems to have no problem killing family members as she threatens to kill her daughter, Vitani, which also makes her a sociopath. She can be caring, both geniuinely and mockingly so. She cooes to Kovu after harshly telling him to hush and mourns over Nuka's death. As suggested in the movie, Zira was previously a Pridelander during Scar's reign as king, where she bore Nuka, Vitani, and Kovu. 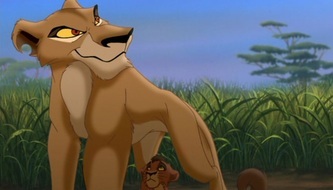 While the lion was still alive, the two of them raised Kovu to be Scar's successor; his protege. After Scar's death, they were exiled immediately afterward by Simba for their remaining loyalty to Scar. It is revealed her and her pride had some type of authority of during Scar's reign. Zira is first seen trespassing in the Pridelands, and closely examining her son's interactions with a female cub, snarling when the cub reveals herself as Kiara, daughter of Simba. When Simba himself appears ready to hurt Kovu, Zira quickly intervens, roaring at Simba and stopping the younger lion in his tracks. The two lions converse, Simba telling her she broke the law of the land and must suffer the consequences. She offers up Kovu to Simba who hesitates to kill the cub, something she knew he wouldn't be able to pull off. Simba tells them to get out, saying their business is finished, but Zira corrects him and smirks dangerously and knowingly at Kiara, stating their business was far from over. She grabs Kovu and leaves, returning to the Outlands. Zira strides by an informative Nuka, ignoring him with a less than pleased expression on her face and a helpless Kovu in her mouth. She drops the cub none-to-gently into the sand and turns her pent up fury about the cub's disobedience on Nuka. Kovu steps in on his brother's behalf and she chews him out instead. She questions him into oblivion about acting friendly towards a Pridelander rather than repeling them like he should've done and through her scolding gets an idea: to get Kovu to use Kiara so he can kill Simba. When Kovu is a young adult and has completed his training, she circles her son, very much approving of the manipulated monster she's created in Scar's image. She comments "he had the same blackness in his soul Scar had" and reaffims her teachings by questioning Kovu himself about his destiny, teachings and his mission to kill Simba and take Scar's place as king. Vitani and Nuka ignite the Pridelands during Kiara's first solo hunt, and Zira watches the flare with Kovu by her side. She commands him into action and leaves herself. After the fire rescue, Zira and Nuka sit a little away from Pride Rock and observes Kovu's actions. Nuka is dissaproving of his brother's not harming Kiara, but Zira rebukes him, stating that Kovu was following the plan as he was supposed to be and that the fire rescue worked perfectly. She expresses her approval and anticipation by snapping a branch in half. 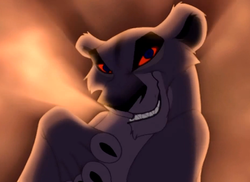 Later, after Vitani reports Kovu is no longer on board with the plan, Zira quickly devises a plan to get Kovu back. When Simba takes Kovu out to walk, she the rest of the Outlanders ambush him, and credits Kovu for this. As Simba instantly loses all his trust for Kovu, she order her pride to attack. They pursue him through the clogged gorge and eventually trap him at a dam. Simba climbs up the wall of logs, and upon seenin at the top, Zira commands him to get Simba. Kovu, instead, does nothing and so Nuka climbs up the dam, seeing his chance to prove to everyone he is the lion everyone thought Kovu was. However, he is pinned under the logs, and dies in the process. 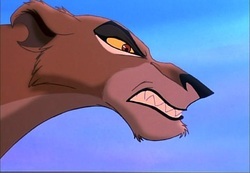 Zira mourns her son's death and quickly accuses Kovu for it (even scratching at his face, thus making a scar like Scar's over his right eye), causing her son to run away guilt-ridden. With her son dead and the chosen one 'corrupted', Zira has had enough, and moves into the Pridelands to take it by force. The Pridelanders meet the Outsiders head on and after telling Simba that she refuses to go home, she commands her troops to attack. 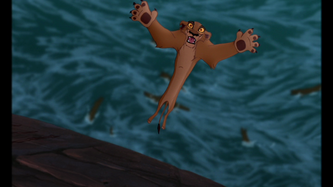 Zira stays on an elevated knoll throughout the majority of the fight, and upon seeing Simba swarmed by Outsiders (though stilling holding his own), she attacks. The two face off, but Kovu and Kiara intervene. Moved by Kiara's words of We Are One and disgusted that Zira threatens her own daughter, the Outlanders cross over to the Pridelanders side and stand against Zira leaving the lioness unwilling to let go of the past. On Scar's behalf, she leaps out to kill Simba, but Kiara intercepts it and the two roll over the side of a cliff. 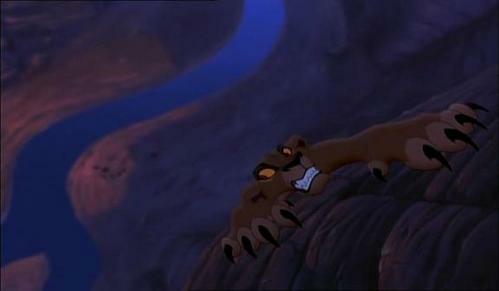 During this time, logs off to the side of the gorge burst, which opens a massive river underneath the lionesses, and after refusing Kiara's help twice, Zira finally falls to her death.